Once upon a time, when the internet was not as old as it is now and companies roamed the wastelands on a quest for those crucial backlinks that would give them higher rankings in the SERPs, an algorithm was born. Created by the lawgivers of Google, this was an algorithm like no other. (Well not quite, but it does sound good, doesn’t it?) 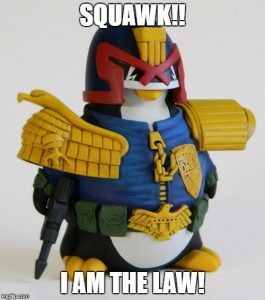 This avian lawman was to wander the vast wastelands of the web upon the backs of countless spiders, searching out spammy backlinks and those who would gather them in order to gain ranking. The date was April 24th 2012 when the first Penguin rolled out, and the effects were devastating. Once caught in that adamantine Penguinan grasp many companies lost ranking, some eventually withering and dying in the chokehold of low web traffic. 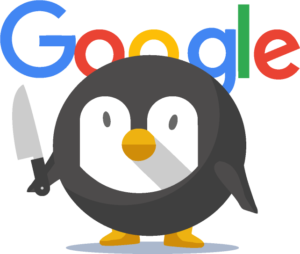 As time went on, naturally the Penguin also evolved, and the Google overlords rolled out version 2.0 in May 2013, followed by version 3.0 in October of 2014. For those caught in his net, the Penguin’s justice was swift and without chance for redemption. And even though companies rushed to change their foul, spammy backlink ways, there was no chance of salvation. Like any criminal in the dock they could protest by disavowing their links, but in the end it was this Penguin Judge Dredd who would have the last word. To make matters even worse, the rise of this new kind of lawman also brought about the rise of a new kind of outlaw – the negative SEO bandido. These black-hat bandidos would hoard their spammy backlink minions and direct them at the sites of those they wished to take down. 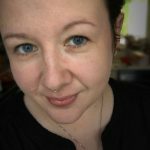 Like an army of flying monkeys, these backlinks would enter and nestle in the backlink registry of any site so ill-fated as to play unwilling host to these cancerous links. And there they would remain, awaiting discovery by the Penguin, or the order to retreat by their black hat masters after the site owner copped to an extortionate payment. The denizens of the web-lands called out for mercy, for a less brutal Penguin who would give them a chance to mend their wicked ways and rise back up to their former glories. Again and again the people asked for a new Penguin, a kinder Penguin who would not condemn them to the slow death of lost ranking. Finally, on a day that will forever go down in history, the overlords of Google gave the people what they wanted – a chance for redemption in the form of Penguin 4.0. This Penguin, though tasked with essentially the same mission as his forefathers, was created to do so in a fairer way. 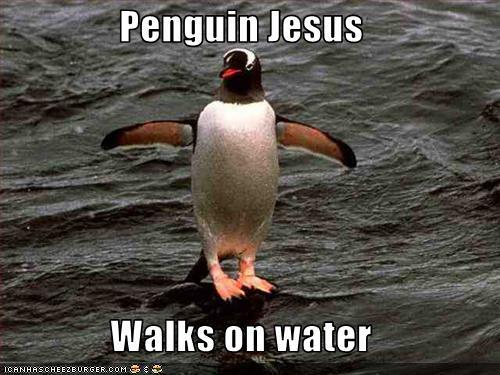 Like some kind of Penguin Jesus, he would blast through the webby wastelands, showing people the error of their ways, but also giving them the chance for salvation they had so long craved. It’s a new day, fellow denizens of the web! One in which spammy backlinks do not have to mean crash and burn. Rejoice people, for it has been coming for a long time.